This mini human factors test is going around Facebook. 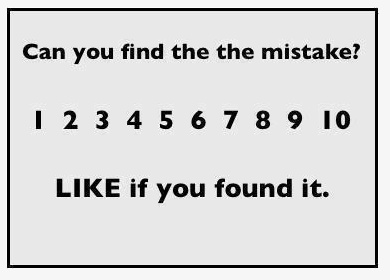 Once you find the mistake it becomes almost impossible not to see it. This is why we need barcode medication identification systems for preparation and administration. And this is why it is so important to understand what was actually known at the time of an error and not what we know in hindsight. Many errors occur when people are doing what they always have done. Usually there is no significiant deviation from norm.